Each design is individually unique, tailored to your needs and desires. After a consultation with our Certified Kitchen Designer, Inscape Design Studio will design a creative and efficient plan for your kitchen, bath, media center, wet bar, closet, library, study center, laundry room… the possibilities are endless. Start by contracting Inscape or stopping by the studio located at 200 Windsor Avenue in Americus, Georgia to make an appointment. If building new construction, you will be asked to bring along a copy of the blueprints. If this is a remodel, a representative from Inscape will visit your home to take measurements. From there, we will discuss with you the features that are important to you. You will be asked to fill out a questionnaire that will cover most of these points. Any pictures or clippings that inspire you are always welcome. A design fee will be charged based on the scope of the project. All of our cabinets are guaranteed for custom fit, superior craftsmanship and exquisite finish. After the cabinetry style, wood and finish have been selected, a deposit is required. The order is placed and an estimated ship date will be issued. Upon receipt of the order mill-work begins. All cabinetry is custom built for your project. Each piece is uniquely made to fit your style selection, your wood selection and your finish. 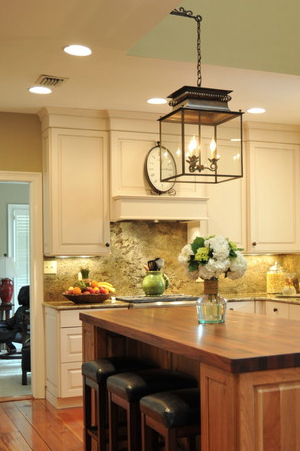 Installation of custom cabinetry requires superior installation by superior craftsman. Inscape Design Studio, Inc. includes a support staff with over 60 years of experience in cabinetry installation. Installation can be the most intimidating factor of remodeling. The removal of existing cabinetry in installation of new cabinetry is handled by accomplished craftsman. They respect your home, the property and the most importantly the people in it. Inscape Design Studio offers complete design consulting services. Whether it is the lighting plan, plumbing selections, coordinating wall surfaces, flooring, counter and back splash selections we can accompany you on making these decisions.